Ever since we moved into our current home around 3 years ago the one thing we missed at our old house was our garden. We had a lovely decent sized garden with a shed where Amelia could run around and play, we had picnics out there, BBQ's and Amelia had her tent up the majority of the summer. We decided to move to be in a better area and one of the consequences of moving was giving up our garden which at the time seemed fine as we have a park just a short few minutes around the corner and we usually always end up going out somewhere on nice days. However over recent months now that Harry is older and we've been having a few days of nice weather here and there one thing I have missed is our garden. Some day's it's just nice to have a day at home, but it would be nice to get out in the garden instead of being cooped up inside. Currently we have a small paved back yard which is fine for putting the washing out or letting Amelia play outside but it's not a garden and we don't spend much time out there at all. I love this house so don't really want to move any time soon as no doubt I wouldn't be able to afford to rent anything decent for the same price so for now we just have to live with it and wait until I can have my dream garden when I am finally able to get onto the property market! I have been looking at getting a few bits for the garden and trying to make it a nicer space so we can actually go and sit out there in the evenings, have friends over to have BBQ's and not feel ashamed of it. 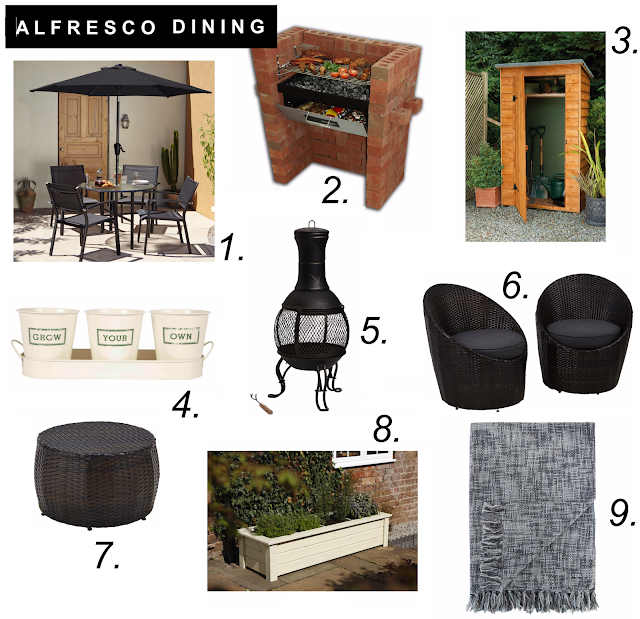 I was really impressed with ASDA's outdoor furniture range and couldn't resist adding a few bits to my garden wish list. Whilst we wouldn't be able to fit all of this out there in the tiny yard we have a girl can wish right? We do have a set of table and chairs out there but they are around 5 years old and have never been stored away as we have no shed so they're a little worse for wear. I'd love to have a nice sofa set like this one day. We desperately need a shed or some sort of storage out there to store the kids outdoor toys and bikes away but don't really have room for a decent sized one unfortunately so some sort of storage like the one above would be great! One day I'd also love a kids playhouse and be able to do it up all nicely for the kids. I've always wanted a chimnea and this will be perfect for late summer evenings sat outside with a few alcoholic beverages after a BBQ. I think I might buy it now as you can get waterproof covers for them seeing as we wouldn't have anywhere to store it over the winter. What would you include in your dream garden?